Riley is home from CHOP!! We were actually kicked out of the room this morning because they needed the room! The 2 remaining veins were narrowed in the same area, and Thankfully with stood Another Ballooning! He settled right into the CICU Post Cath! I think he may be starting to know the routine. Here are a few pictures from Before Riley’s Cardiac Cath. 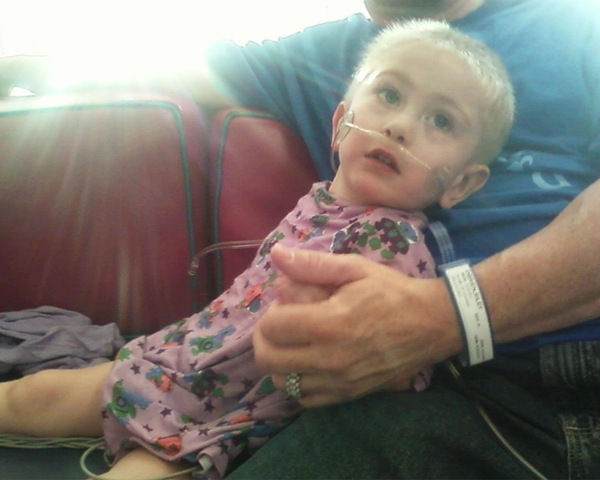 Riley watching some cartoons before the Cath. 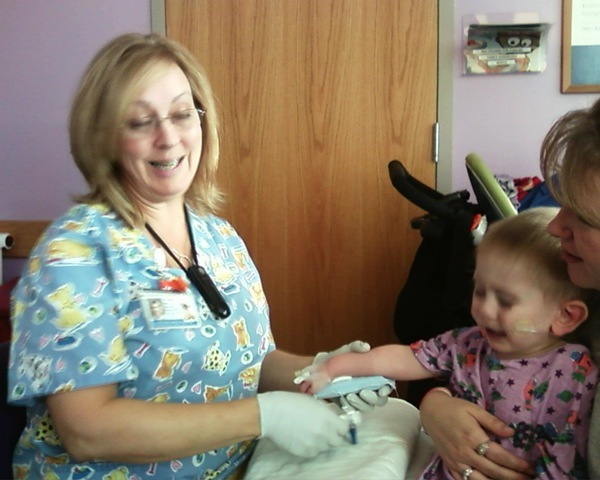 The Best Person on the IV team….”Chatty Kathy” placing Riley’s IV PreCath. 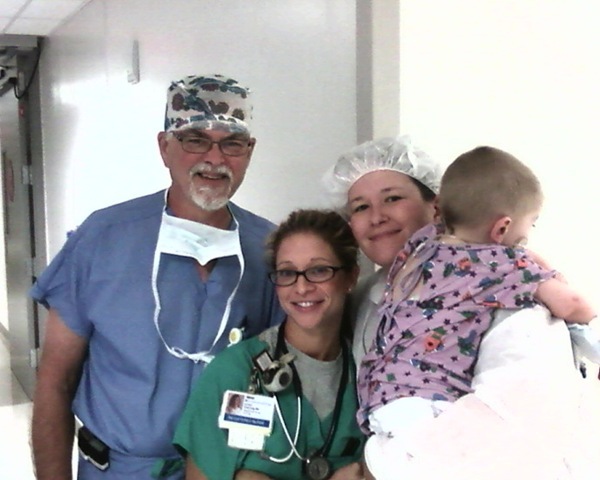 Dr. Jobes…Lauren (RN)…Riley and Mom headed to the Cath Lab. 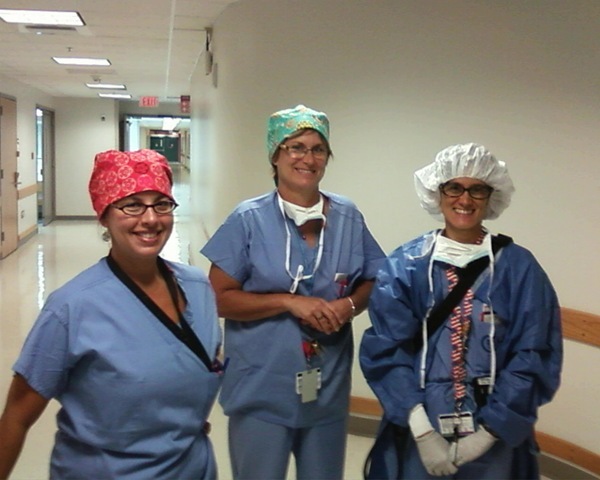 Three of Dr. Jobes Fellows….on their way to Riley’s Cath. 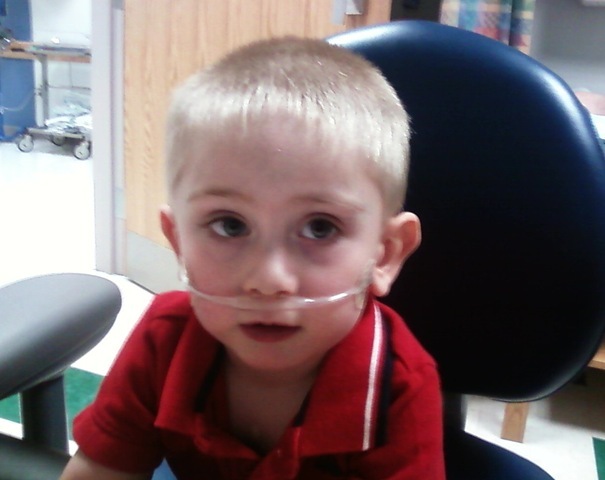 Tomorrow…6:30 AM we will report to Children’s Hospital of Philadelphia for Riley’s Cardiac Cath. He started his premeds today because of his reaction to the contrast. I pray, once again, that Monday is a Complication Free Day! Riley’s risks are through the roof, but so far he has always returned to us ok, minus the time the vein was punctured, but that was resolved quickly! Riley had pretesting today. Everything went ok. The usual… Blood work and Chest XRay. He is scheduled for the first case on Monday morning. We have to be at CHOP at 6:30 am….Fun. Post Cath he will be admitted to the CICU. Hopefully just for the night! We have two days before the Cath that the pager can go off for Transplant……. Riley’s Cath has been scheduled for Monday the 30th. Sorry to anyone at CHOP who reads this, but…..I had to do some bitchin’ to get it scheduled! I called transplant and was going to be transferred to one of the NP’s, but she knew nothi…ng of the Cath. The NP we saw Monday was out today. Then I’m told that all these docs were out this week so the NP’s have been really busy covering…etc…etc. I say…. Ok. I understand that, but that should have no affect on my son’s Cath being scheduled. So…my son’s veins that are obstructing have to wait cause you guys are busy? Right! We’ll you all are a team with major communication issues. I NEED SOMEONE TO CALL SCHEDULING OR GIVE ME THE NUMBER CAUSE RILEY NEEDS TO BE CATHED! So we hang up…she calls scheduling and calls me back and says they have the request, but nothing has been scheduled. Literally 2 minutes later the phone rings and we’re scheduling Riley’s Cath. YOU ARE YOUR CHILD’S BIGGEST ADVOCATE…..
On one other note…. I called back to Cardiac Intake to make sure I request Dr. Jobes for Anesthesia. I’m told…. Kerri hasn’t seen him lately. That he has been getting ready to retire! I’m like…NO! We Love Dr. Jobe’s…he is great with Riley and gives him the time he needs to get sedated because of his poor pulmonary function. We have had other just mask him and hold him down until he was under….ahh…no. So I called it pretty good. Riley will be Cathed within the next two weeks. Pulse Ox was between 70%-75% at our visit, but like I mentioned before Riley’s reflux is going crazy. We have noticed over the past two years that as his O2 supply lowers his reflux increases. Dr. Hanna is putting him back on Reglan. I had stopped it after the Norovirus because while he was admitted they explained what Reglan does and that was explaining why before the Norovirus he was destroying an outfit with every BM. So I hesitated today, but we’re gonna lower the dosage and give it a try. Start ruining clothes again …. Reglan stops! So we’ll see. When I know more I will be sure to share ……. Riley waiting for Dr. Hanna….